Alright friends, either the picture for this muffin was stunning or you all are in need of some extra fiber in your lives!!!! I will be 100% honest, some folks in this family need the extra fiber. A few of my kids have a regime of taking 2 dried apricots in the morning and 2 in the evening, seriously the best natural medicine. That being said, I’m always on the hunt for a good breakfast goodie that packs nutrition, tastes good and super easy to make. Breakfast is such a struggle around here, many mornings it’s cereal and a banana with some milk on the side as breakfast. I can’t fight it, I can’t argue, I just have to go with whatever they eat that day. I know they won’t starve but it’s a long way from breakfast to lunch on a school day. While trendy, avocado toast seems to be a winner around here and I won’t argue because it is delicious! As you all know, I love to bake, so a good breakfast treat can go a long way. I bought a box of bran flake cereal a few months ago in hopes of making something like this but never got around to it…until last night. Bran flakes + molasses + raisins, it was a combination I thought would be PERFECT and surely win over the kids. It’s essentially Raisin Bran without getting soggy in a bowl of milk. 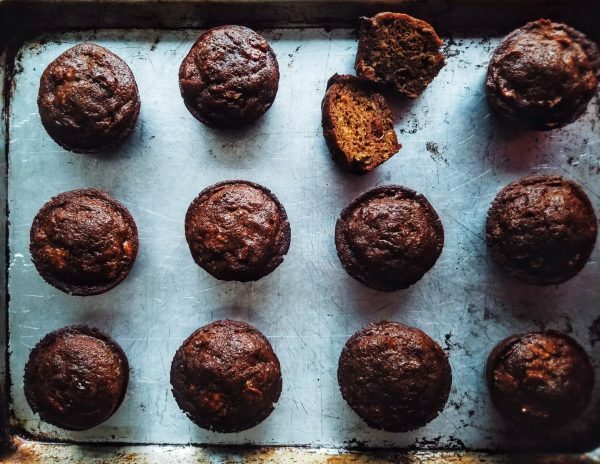 So whatever your reason for longing for these muffins, I hope you enjoy them! As always, I love seeing your creations. Be sure to tag me on Instagram @CosettesKitchen or post on my Facebook Page. Preheat oven to 375 degrees and spray muffin tins with non-stick spray, set aside. In a bowl, combine your flour, baking soda, cinnamon, salt, (flax seeds) and raisins. In another large bowl, combine your wet ingredients + brown sugar. Add your bran flake cereal to the wet ingredients and allow to sit for about 5 minutes. Slowly mix your dry ingredients into your wet ingredients and mix until just combined using a spatula. Your batter will be a bit runny (it's okay, it should be). Fill your sprayed muffin tins full, leaving just a small space to the rim of the top. Be sure to scoop up raisins in each scoop. The muffins will rise but won't spill over, they will pillow up. Bake for 25-30 minutes until golden brown and cake tester comes out clean. Remove from oven and while still hot, brush tops with honey. Remove from muffin tins, allow to cool on cooling rack and enjoy!